There’s snow and elves and Santa, too. There’s a bewildered mom, a frustrated son and a very, very grinchy father. But mostly there’s Buddy, a guy so sweet, as one elf quipped, “If he were any sweeter, we’d be diabetic.” The guy who loves Christmas with all his heart and soul. Buddy has been raised by elves at the North Pole. When he realizes he actually a human, Santa breaks it to him: His mother died shortly after he was born, having never told his father that she was pregnant. Oh, and dad’s on naughty list. If it sounds familiar, that’s because “Elf the Musical,” which opened last weekend at Spokane Civic Theatre, is based on “Elf,” the Will Ferrell movie from 2003. Civic’s production, directed and choreographed by the always-reliable Kathie Doyle-Lipe, is loaded with charm and a cast that’s game. It’s light-hearted and family friendly, and makes for an entertaining evening. The show follows the familiar beats of the film, while not being a carbon copy. Our story is narrated by Santa (Kim Berg) who is inexplicably a Boise State Broncos fan. When Buddy learns that his father, Walter, is a children’s book publisher who doesn’t believe in Christmas, Buddy sets off from the North Pole and emerges from the Lincoln Tunnel in Manhattan. After being rejected by his father and his family, including Walter’s wife Emily (Sara Linn) and son Michael (Aiden Else), Buddy wanders into Macy’s and takes a job in Santaland. There he meets Jovie (Emily Gjovik). The actor playing Buddy, Seth Flanders, is younger (and less doughy) than Will Ferrell when he created the role for the movie, so some of the “man child” visual humor isn’t as obvious here. That said, Flanders acquits himself quite well as Buddy the elf. He is excessively cheerful. His vocal performance was on point, and I especially enjoyed his work with Deb (Kate Wee) in the ensemble number “Just Like Him.” He proved to be a deft physical comedian, too, as when he struggles mightily to keep quiet while at Walter’s office. The vocal performances across the board are quite good, especially Linn as Emily Hobbs in “There Is a Santa Claus” and Gjovik as Jovie in “Never Fall in Love (With an Elf).” The choreography is well done, too, with kicklines, tap dancing, and a lot of high-energy movement across the stage. Mostly, the changes the show’s creators – written by Thomas Meehan and Bob Martin, with a score by Matthew Sklar and lyrics by Chad Beguelin – made from the movie worked for the stage. An effective scene in Act II featured eight department store Santas hitting the bar after their last shift on Christmas Eve, where they performed “Nobody Cares About Santa,” serving to 1) showcase how cynical the modern world is, and 2) give us an excuse for a Santa kickline. One point I think they missed the mark on, though. In the movie, as New Yorkers huddle in Central Park, Jovie takes to heart Buddy refrain that “the best way to spread Christmas is cheer singing loud for all to hear.” She starts singing “Santa Claus is Coming to Town” and soon the crowd joins in, giving Santa’s sleigh just the boost it needs. In the musical, the cast sings a reprise of the fine if hardly memorable tune “A Christmas Song,” featured in Act I. Yes, using “Santa Claus Is Coming to Town” would have involved paying royalties. But it might have been worth to engage the entire audience in a singalong. Talk about giving Santa a boost. 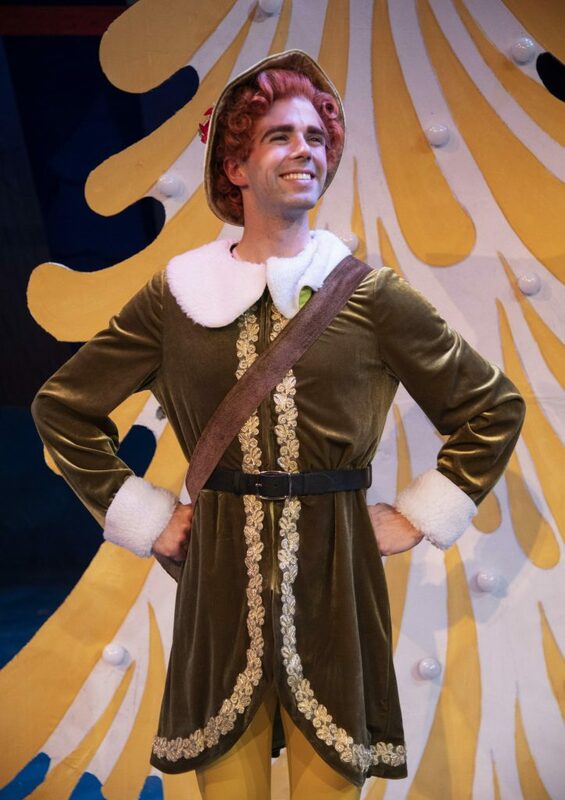 All in all “Elf the Musical” is exactly the kind of Christmas treat people like. It’s bright, sparkly and cheerful. It goes down easy, and leaves you smiling at the end.